Join Aliesa George on Saturday, February 1, 2014 in Topeka, KS for fun, information-packed workshops and discover new ways to improve fitness and reduce pain, increase strength and flexibility, and enhance your whole‐body health. All workshops are appropriate for: Pilates Students & Pilates Teachers (CEC’s thru petition). Space is limited. Register for both workshops by January 1st for only $97. Discover easy exercises you can add to your workout program to develop healthy movement habits, reduce neck and shoulder tension, and enjoy, healthy, pain‐free shoulders! 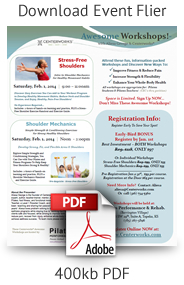 Includes: 2‐hours of hands‐on learning and practice, PLUS a Stress‐Free Shoulder Exercise Handout and Exercise Guide. Explore simple strength and conditioning strategies, you can use with your pilates and fitness programs to help keep your shoulders strong & healthy! Includes: 2‐hours of hands‐on learning and practice, PLUS a Shoulder Mechanics Handout and Exercise Guide.